One of the joys of living in Fox Park is getting to know Tower Grove Park. It is a spectacular place, not fully realized from driving by or through it. You have to walk it's ~289 acres and build memories within it. Luckily having kids and dogs, we've built such memories. We love this place. For many photos and some light commentary on the park, read about our TGP blog HERE. 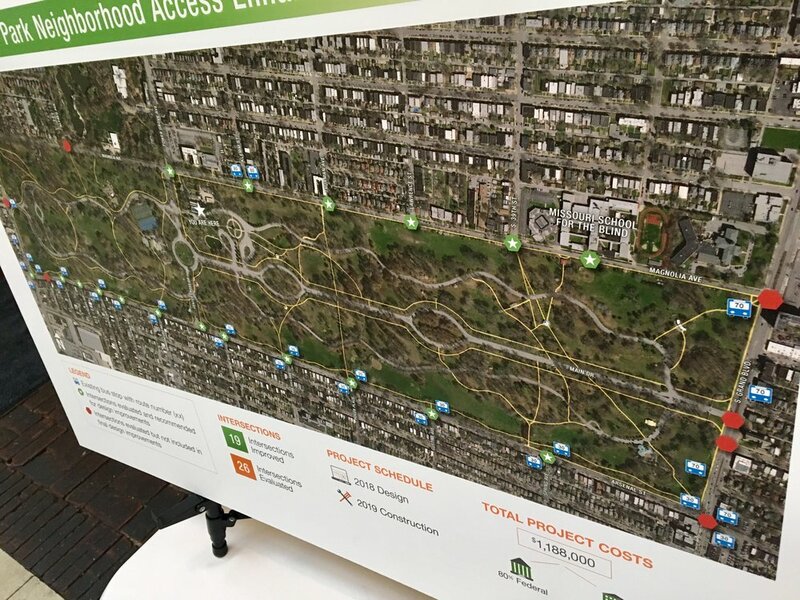 Last night we swung by the open house and public feedback session for the pedestrian access improvements that are in the final stages of planning for the park. 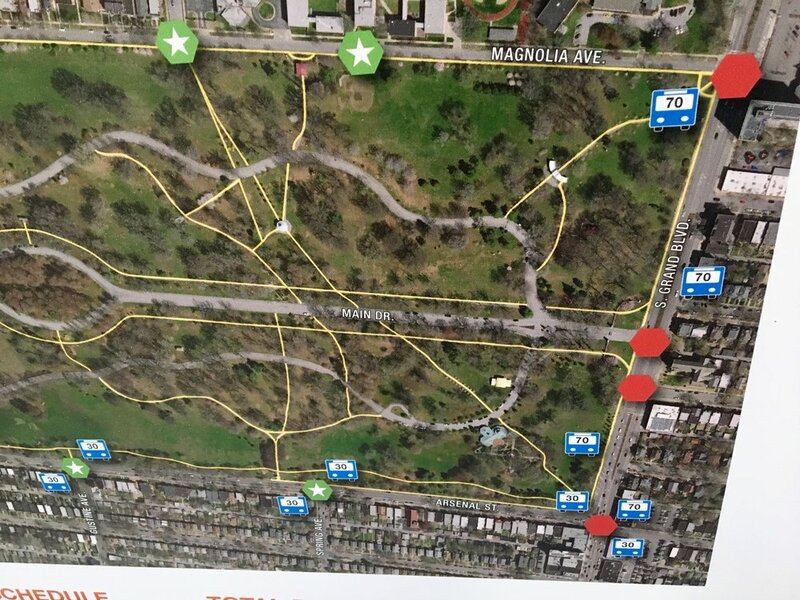 This is a massive effort to help safely get people walking and biking into the park and back to Shaw, Southwest Garden and Tower Grove South. Notice I'm not mentioning Tower Grove East because those connections along Grand are not being addressed in this round of accessibility upgrades. There are a total of 26 documented entries, and 19 of them are being upgraded in this round. There are 5 entries along Grand, 1 along Kingshighway, 1 on Magnolia and 1 on Arsenal that are not being addressed in this round. This is not some haphazard assessment, a comprehensive field audit was conducted and priorities were made based on the budget. Ah, these things are not free. And money is indeed being plunked down, and this stuff ain't cheap. In fact, this is a $1,188,000 project. Thankfully there are folks hard at work getting Federal support. 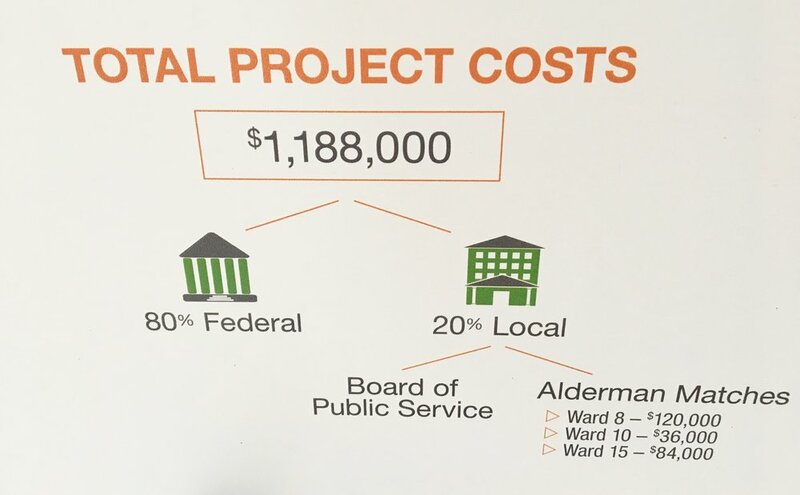 80% of the funding is coming from the Feds and the remaining 20% broken up between Wards 8, 10 and 15. The breakdown amongst wards seems equitable since Ward 8 shares the most border with the park followed by 15 and 10 respectively. Spending ward money on pedestrian improvements makes sense in densely populated parts of our city where people actually walk. This area fits the bill. The four neighborhoods flanking TGP total ~30,882 people living in walking distance of the park (source); that is ~10% of St. Louis' population. Yep, that's a lot of people. So while we were disappointed to not see work being done on entrances across Grand and Kingshighway at Reber Place, we were thrilled with what we saw at the other 19 intersections. By our amateur assessment, crossing will be more visible and car lanes narrowed at crosswalks and bump outs realized to make crossing safer and less steps in traffic. Each entrance will lead to an existing path/sidewalk within the park. The upgrades and improvements include important features like bump-outs, high-visibility painted crosswalk markings, upgrades to existing cross signals, ADA-accessible ramps/landings. There are some elements of stamped concrete and narrowing of traffic lanes to attempt traffic calming measures. So plans are being finalized based on the final public feedback and preliminary construction work is expected to begin in Spring, 2019, with an anticipated completion by Summer, 2019. Well done St. Louis. Congrats to all involved on procuring the 80% Fed monies and pitching in Ward money for something that will benefit so many.